Lotto By Text is one of the UK’s biggest lottery syndicate services. The site is owned by Bitstacker Ltd who have been operating since 2006. They have significant experience in the mobile and gaming industry. Since launching they have thousands of players and LottoByText is now the leading platform in the UK mobile lottery market. Their vision is to create a fast, easy and reliable way of receiving National Lottery alerts and other beneficial services on mobile phones. 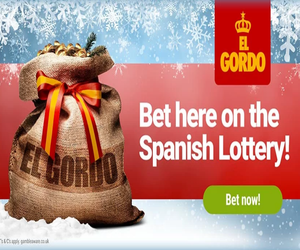 Opening / Special Offer: By signing up with them today you can play 5 free syndicated lines on the National Lottery and EuroMillions. After the free trial is over you can either cancel or continue your subscription. You can cancel the subscription at any time by simply texting the word ‘Stop’ to ‘85200’ If you decide to carry on you will get 15 chances every week which is payable at £4.50 per week through your mobile phone. For every 4 weeks that you decide to continue you will also be entered into their prize draw to win a £300 Amazon voucher. Syndicate Information: Each syndicate is up to a maximum size of 49 people. You can find out how many people are in your syndicate by clicking on the terms and conditions in your ‘my tickets’ area online. If you win your share will be divided equally between the members in your syndicate. Payment Options: You must sign up with your mobile phone number. After the free trial is over you will be billed £4.50 per week for 15 entries in the National Lottery / Euromillions draws. This will be SMS billing. If you are on a contract phone it will be taken off your next bill, if you are on pay as you go it will be taken from your available credit. Winnings: If you win then you can make a claim by entering your claim reference number in your members area. If the amount you win is for less than 60p then you will get 5 free syndicated entries into the next Saturday National Lottery draw. If your claim is for anything below £1000 then you can choose to have a cheque sent through the post, this will take 5 – 7 working days. Alternatively you can choose the express option and receive a unique code to your mobile. This code can be taken to any Post Office where you will receive cash for the amount you have won. For any winnings above £1000 you must contact their customer services.